Linda got confirmation yesterday that our lab orders had been put in by our doctor. The blood work requires a 12 hour fast (minimum) so we finished dinner last night before 8 PM and did not have breakfast this morning. We headed out around 8:30 AM for the Henry Ford Health System Columbus Center in Novi, the nearest HFHS lab to our house. We would not normally get on I-96 at that time of day due to rush hour traffic but we wanted to get this taken care of early and then get something to eat and drink. We got to the lab at 9:15 and it only took a few minutes to get our blood drawn. We then headed to the Panera on Novi Road at Grand River Avenue for bagels and coffee and some down time to sit, relax, read, research, and write. Linda spent some time last evening researching wallpaper installation but found conflicting information. I got online and looked at some of the same websites. Wallpaper is a little out of style at the moment and some of the website information was over 10 years old but still seemed relevant. The interior walls of our motorcoach are finish grade plywood that is firmly attached to the structure of the bus with spray foam insulation underneath. The issue is how to prep the plywood before we hang the wallpaper. Some sources indicate that we need to size it, some say to prime it, and others say to use a liner material and then prime, all before hanging the paper. Other sites, however, say to just hang the paper directly on the plywood and be done with it. We left Panera and were headed west on Grand River Avenue. We noticed that Chuck’s truck was at his shop so Linda made a U-turn and we stopped to see if he was there. He was, so we visited for a while and got to see their new refrigerator and discuss the installation, which Chuck somehow managed to do all by himself. Even with the use of his forklift, that was quite an accomplishment. We got back to the house at 12:45 PM, changed into our work clothes, took care of a few chores, and had a light lunch of fresh apples, pears, and hummus with onion on rye bread. I then called Josh Leach at Coach Supply Direct and left a message asking him to follow up with Ferman Miller at Countertops Plus. If Ferman does not have any more of the Sandstone Corian I want to make sure Josh gets the 30″x48″ piece from the other supplier before it disappears. The entrance landing with the floor removed revealing the pneumatic linear actuator that operates the slide out stepwell cover. When we finally got to work on the bus around 2 PM Linda focused on stripping the old wallpaper and I started preparing the entrance for tiling. She taped off all of the wood trim where she is working, spread painter’s plastic to protect the floor, and wrapped the two living room captain’s chairs. I removed the existing vinyl tile from the entry platform, removed the plywood cover, and uninstalled the step well cover. I then removed the tile and treads from the stairs. I also moved the passenger seat forward and determined that I can probably get to the swivel shaft retaining nut from the back. Removing the seat by removing this one nut will make it much easier to tile that part of the cockpit. Ditto for the driver’s seat. Although we got a late start on the bus today, and worked on it for less than four hours, we were satisfied with what we accomplished. The old tile came up more easily than I thought it would which bodes well for getting the entry/cockpit tiled with the new Armstrong Alterna Luxury Vinyl tile. I called Phil Jarrell to verify that he had called Miss Dig and told them to mark the gas main and not just the utilities running to the house. He said he did and expected that they will be here on Friday. I will keep an eye open for them and intercede if possible. Phil expects to start our job on Tuesday. If he does he will probably be finished by the end of the week or over the weekend. 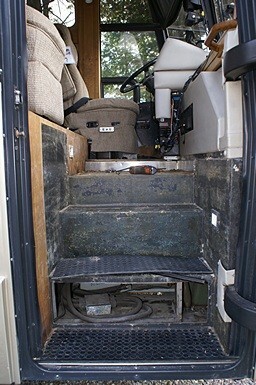 The entry stairs into the bus with the bottom riser cover plate removed to reveal one of the two air-conditioner compressors installed in the spare tire compartment. This is how the ports are accessed for service and recharging. The other compressor is accessed through the bay under the driver’s seat. Linda let me know that our lab results were available so we each logged in to our HFHS MyChart accounts to look at them. Linda’s lipid profile showed a higher total cholesterol than she expected and she was not happy about it. Dr. Vangel had seen the results and commented that they were OK, but Linda was perturbed about it none-the-less. My total cholesterol was also higher than I would like but not as high as Linda’s. Her LDL and HDL numbers and ratio looked good and her HDL, in particular, was much better than mine. This was no doubt a consequence of her almost daily exercise walking. We apparently do not fully understand the lipid profile numbers or what we still need to change about how we eat to bring them in line with the guidelines put forward by people like Drs. Neal Barnhard and Caldwell Esselstyne. Linda made a nice salad to start our dinner, served with a small glass of Moscato. The entrée was a mock chicken scaloppini that she picked up at Whole Foods. For a side dish she steamed kale with mushrooms, onions, and garlic. After dinner we sat on the back deck and enjoyed a second small glass of Moscato. I went to my office and edited the blog posts for July 23 through 31 and hope to upload those posts tomorrow. I had an e-mail from Molly Pinner with Linda’s invitation to work as an office staff volunteer at the 2016 Escapade in Essex Junction, Vermont. I replied to that and cc:d Linda. I then e-mailed Lou and Val Petkus to let them know. I was wrapping up for the evening when I got an e-mail from Ed Roelle with the September CCO Newsletter. He develops the newsletter in MS Word and I convert it into PDF for him. I took care of that and sent it to him and then went upstairs to watch a PBS program on scenic train rides of North America. The program was interesting but PBS was fundraising again, and the fundraising segments were longer than the programming segments. It seems like this has been going on all summer and we are, quite frankly, tired of it. After clicking around the other channels I turned the TV off and went to sleep. This entry was posted in Bus Projects, Escapade, Family-Friends-Home, Medical-Dental, RV-Travel, SKP and tagged 2016 Escapade (Essex Junction VT, blood analysis results, Bob & Molly Pinner (SKPs), bus wall construction (H3-40), Caldwell Esselstyne MD, CCO newsletter, Chuck Spera (H3-40 Liberty), Columbus Center (HFHS), Corian Sandstone, Dr. Vangel (HFHS), Ed Roelle (GLCC & CCO), Ferman Miller (Countertops Plus), hummus sandwich with onion (vegan), interior remodel (H3-40), Josh Leach (Coach Supply Direct), LDL & HDL cholesterol, lipid profile, Lou & Val Petkus (SKPs), Miss Dig, Neal Barnhard MD (PCRM), Panera (Novi MI), PBS fund-raising, Phil Jarrell (Precision Grading), Refrigerator (H3-40), sliced pears (WFPB), vinyl tile removal, wallpaper installation, wallpaper removal (H3-40) on 2015/09/24 by BRF. We overslept and did not get up until 7:15 AM. The weather has been very pleasant all this past week but we awoke to light rain. We left for our SLAARC breakfast at 7:25 AM and took a different route than usual to see how it would be for the bus. I headed north on Hacker to M-59, east to US-23, and south to I-96 east. The ramp from US-23 south to I-96 east is a left exit, left entrance, with a very short merge lane in the middle of a major construction project. I decided that was not our best option for the bus. We arrived at breakfast at 8 AM to find a dozen people already there but at least 10 more showed up after us. We enjoyed the conversation, as we usually do, but did not linger and were on our way back home by 9:15 AM. As soon as we arrived we changed into our work clothes and got busy with the final preparations to move the bus to Chuck’s bus garage in Novi. I pulled the bus out at 10:30 AM and Linda followed in the Element, which had all of the pieces we had removed from the old refrigerator along with tools, blankets, and some 2x4s. The bus roof was brushed by a few small, low branches getting from our house to N. Hacker Road, reminding me that I need to covertly trim trees and bushes along our street. I say covertly because they are not on our property. The last time I took the bus out we went south on Hacker to Grand River Avenue. This would have been our preferred route today except that the trees are not trimmed up in a few places and one of them, just before Bendix Drive, clunked the stuff on our roof pretty hard last time. I did not care to repeat that so I went north as we had this morning in the car. At M-59 I headed west to Latson Road, a trip of some four to five miles in the wrong direction. The reason is that Latson Road going south has a relatively new, and easy to navigate, intersection with I-96. From there we had an easy run to the Beck Road exit, a short jog south to Grand River Avenue, an easy left turn, and the final mile to Chuck’s shop where we arrived at 11 AM. Chuck had already pulled his bus out of the building and parked it out of the way but there were several trucks and a dumpster trailer blocking access to his door. They belonged to a motley crew that the owner of the building in front of Chuck’s shop had hired to clean up some of the mess left behind by the sunroom company that just moved out of the building. He had me pull up to the right and position myself to back up and then negotiated with the workers to move their vehicles. I pulled up the tag axles and waited. The workers were not happy about it but they did it. To get our bus into Chuck’s shop nose first he had me back parallel to the building and then bring it around to the passenger side into a space adjacent to the front building until I was perpendicular to his door. I was then able to pull straight in but I did not pull in all the way. Chuck had me stop with the fixed window frame opposite his forklift which he had already positioned for use. The on again, off again light rain was not a factor as the window frame we needed to open was well inside his shop. Linda and I unloaded all of the stuff from the car and brought it inside the shop. We realized that we forgot to bring the camera so Linda tried to capture the progress of the work with her cell phone camera. I have put those images in a separate gallery post for this date. Randy, the owner of the Printology business in the suite adjacent to Chuck’s, came over to see what we were up to and stuck around to help. With me working from an 8 foot step ladder outside the bus, while Chuck and Linda worked inside, we opened the window frame about 24 inches and propped it with a piece of 2×4. I then carefully lifted the window higher while Linda sighted along the bottom of the upper cabinet. When I had the frame high enough to be clear of the cabinet Chuck measured the length of 2×4 we would need to prop it open. It looked like 52 inches would do the trick. I had a 56″ piece of 2×4 so I cut it down to 52″ with my 7-1/4″ Rockwell circular saw. I used the first piece to mark a second piece on an 8 foot 2×4 and cut that. Linda took both pieces inside the bus where she handled one and Chuck handled the other. As I lifted the bottom edge of the window from outside the bus the window hinge (at the top) made some unpleasant (and a bit unnerving) sounds but I got it high enough that they could put the two braces in place and the frame did not come unhinged. We had just finished this task when John Rauch and his son, John, arrived at noon to help move the refrigerators. The old refrigerator was lying face down in the bus. The two Johns lifted it as a test and determined that they would not have any difficulty moving it. Linda fetched one of the blankets and dropped it over the sill of the open window to protect it and the side of the coach. Chuck had placed the long forks on his forklift about two feet apart and slid a narrow pallet over them. He raised the forks and brought the forklift forward towards the bus. 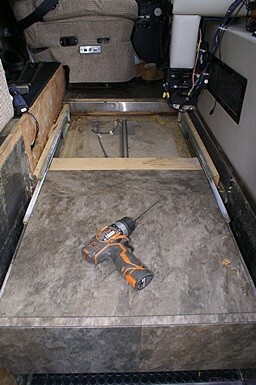 We got him to position the top of the pallet even with the top of the sill and about 3″ away from the side of the coach. John and John are very strong and were able to lift the old refrigerator case and pass it through the window onto the pallet. With a person on ladders on either side of the pallet we slid the refrigerator all the way out. Chuck then tilted the forks slightly, slowly backed away, and lowered it down. John and John got the old refrigerator off the pallet, carried it out of the way, and stood it upright on its base. They then lifted the new refrigerator onto its back, picked it up, and placed it on the pallet. They went back inside the bus while Chuck brought the forklift up to the coach and raised the forks until the pallet was at window sill level. John and John slid it into the bus, stood it up, and rolled it into the alcove. I then secured it in place with a piece of 1×3 wood screwed to the floor across the front to keep it from rolling out while driving. There is approximately three inches of space above the fridge but it cannot tilt out very far before the upper back edge catches the ceiling of the alcove. John, John, and Chuck raised the window frame slightly to remove the 2x4s and close the frame when the top hinge started coming apart. Linda yelled for me and I scrambled over to get another pair of hands on the frame. With me and Chuck holding the outside (free) edge and the two Johns holding the hinge edge I was able to see where the hinge was out and direct folks as to what to do. It took several tries and a few minutes (that seemed like hours) but we got the hinge re-engaged and then closed the window frame. We took a few minutes to rest and chat and Chuck showed John (the father) his race car. The heavy lifting was all done so John, John, and Randy took off, but before they did Linda gave John (the son) a gift for their new baby girl, Lucy Violet. Linda and I put all the shelves and bins in the new refrigerator and then reattached the two doors. That was a bit of extra work as it came with the hinges on the right side but we needed the door to open on the right side. With the doors on we took a moment to consider our choice of size and color (black) and felt we had made the right decision. We started to reassemble the old refrigerator but we were all hungry and decided to go to lunch first. I started the bus and pulled it all the way into the shop so we could close up. Chuck then drove us down the street to Panera for lunch. We took our time and had a nice meal and a nice chat. Back at the shop we decided to switch the buses around so Chuck would be free to leave. He wanted a picture of the two buses together so I backed ours out of his shop, swung around to the passenger side, got parallel to his bus, and then backed up so the nose of our bus was about 10 feet behind the nose of his. He and Linda then both took photos with their cell phones. When the photo shoot was done I pulled forward to the left and then backed in parallel to the building about four feet from the curb. That gave Chuck plenty of room to pull up next to me on my passenger side and then back around next to the front building and get lined up to pull straight into his bay just as I had done earlier. Back in the shop Linda wiped out the inside of the old refrigerator and then we reattached the two doors. As she cleaned each rack, shelf, and bin I placed it back into the refrigerator. When it was fully reassembled we plugged it in. It came on, ran for about 60 seconds and then shut off. It obviously was not cold yet, and might have been cause for alarm if I had not dealt with this “problem” before. I knew from prior experience that the defrost timer had probably disconnected the compressor and connected the evaporator defroster. Chuck pulled out three of his lawn chairs and we sat around waiting for the refrigerator to restart. The only thing missing was three cold beers. We knew the unit still had power as the lights were working. There was an outside chance that the overload protector (fuse?) might have blown, but I did not consider that to be likely. Our patience was rewarded about 25 minutes later when the compressor came back on. While we were waiting we gathered up our tools and various materials and loaded everything back into the Honda Element. Chuck had a message from his wife, Barbara, with her ETA so we decided to settle back into the lawn chairs and kibbutz until Barb arrived. She showed up a little while later and Chuck got out a fourth chair and we sat in the shop listening to the sound of the functioning refrigerator and debriefing the events of the day. As a result of the window frame hinge coming loose I am now of the opinion that I did not need to remove the two stop blocks. I suspect they are there to “stop” the hinge from coming apart and I should not have removed them. Chuck is also thinking about replacing the refrigerator in their bus and is going to check with Prevost regarding these blocks. As much as anything I was annoyed with myself for the amount of time I wasted removing these blocks but what is done is done and I now need to reinstall the one block that came off undamaged and get a replacement for the other one, even though I can only attach it with one machine screw. Butch thinks he can make one for me, otherwise I will have to get one from Prevost. Our local electrical utility, DTE Energy, will pick up used appliances. In the case of a refrigerator it has to be plugged in and running, which I presume means it is functioning and cooling the interior. If so, they will take it away and send us a check for $50. From our end that’s a good deal as we don’t have to pay someone to haul it away. Because of the R-12 Freon there are very few places that will deal with it. My guess is that DTE has a sub-contractor who will recover, clean, and recycle the R-12, which is no longer being made and has become very expensive. They may also recycle the copper tubing and electrical wire, and possibly the metal case and other materials. Even with the labor to do this work the unit must be worth more than $50 to them. We all needed to get some dinner so we wrapped up our visit and started up our bus. I pulled out onto westbound Grand River Avenue followed by Linda in the car. At Beck Road we turned north and then got on I-96 westbound. The bus was at 3/8ths of a tank of fuel so I decided to stay on I-96 and go to the Mobil truck stop at M-52, a run of about 30 miles that would allow the engine and transmission to come up to normal operating temperature. Linda exited at Latson Road and stopped at Meijer’s to do some grocery shopping. The Mobil truck stop is run down with a very poor, pot-holed apron and parking area, but there are usually several tractor-trailers fueling here when we pull in as it is one of only two places that a semi can refuel between Detroit and Lansing. There weren’t any trucks getting fuel when I pulled in but it was 7:30 PM on a Saturday evening and there were a half dozen tractor-trailers settled in the parking area for the night. I poured two bottles of Stanadyne diesel fuel additive into the fuel tank followed by two ounces of Racor Biocide. I then added 125 gallons of diesel fuel to the tank, which took about 11 minutes. By the time I paid for the fuel and was ready to pull out it was 8 PM. I called Linda to let her know I was on my way and then reset the trip odometer. I drove east on I-96 for 10 miles to the M-59 / Burkhardt Road exit and got on M-59, which only goes east from there. Eleven miles later I made the turn south onto N. Hacker Road and completed the drive to our house. Linda heard me idling in the street, where I stopped to lift the tag axles before making the tight right turn into our pull-through driveway, and came out to help get me parked. Once I was positioned correctly I put the tag axle back down, let the engine low idle for a minute to let the turbo spin down and let the heads cool off and the temperature to equalize, switched the Level Low system out of drive mode, and shut off the engine. I shut off the air supply to the engine accessories, shut off the chassis batteries, connected the shore power cord, locked everything up, and went in for the evening. It had been a long day and we were glad to have it behind us. I had been anticipating the refrigerator exchange, with some dread, for well over a month. The concern was that we would not be able to move the units out/in through the window frame, requiring us to remove and replace the lower passenger-side windshield, or that something would go wrong, like the hinge, and turn out to be an expensive and difficult problem to fix. With each passing day it was also becoming a bottleneck in our remodeling project, at least psychologically if not physically. But it was finally done and ended well. We will plug in the new refrigerator tomorrow to make sure it works. We tested it in Chuck’s shop when it was delivered so we expect it to work now. There is a lot of work to do but now we can get on with it and I expect it to go well. In spite of being tired we stayed up and watched the PBS broadcast of the Simon and Garfunkel reunion concert they did live in New York City’s Central Park 10 years after they split up as a duo. Their music remains among my most favorite from my youth and it has lost nothing with the passing of many years. This entry was posted in Bus Projects, Concert, Culture & Entertainment, Family-Friends-Home, Ham Radio, PBS, RV-Travel, SLAARC and tagged bus parking (at home), Chuck & Barbara, Chuck Spera (H3-40 Liberty), defrost timer (H3-40 old fridge, diesel fuel biocide (Racor), fixed side window (H3-40), forklift (Chuck S), Frigidaire FFHT1621QB, John & John Rauch, Mobil Truck Stop (I-96 MI), Panera (Novi MI), R, Randy (Printology), Refrigerator (H3-40), Simon & Garfunkel (PBS), SLAARC breakfast, Stanadyne diesel fuel additive, window frame stop block (H3-40) on 2015/08/08 by BRF.